We are really in the third generation of the present era of the WORLDWIDE CHURCH OF GOD. Few are still living who remember how God started it. HERE IS EYE-OPENING NEWS to most members of God's Church TODAY. And it corrects a false rumor concerning Herbert W. Armstrong and the "Sardis" era of the Church. Mr. ARMSTRONG DID NOT "LEAVE" THE CHURCH OF GOD (Sardis era) TO START THE PRESENT WORLDWIDE CHURCH OF GOD. Nor did he ever seek to draw away any of their members after him! He was never a member of either of the two factions of that church — though he fellowshipped and gave help to each of them. Mr. Armstrong's relation with "Sardis" was one of "GIVING" not "GETTING." TO SET the record straight, once and for all, I give you here the actual FACTS relating to my fellowshipping with the Church of God, Seventh Day, Stanberry, Mo., and the A. N. Dugger "Church of God," Salem, W.Va. Rumors have been started that Garner Ted Armstrong is now doing the precise thing his father did in the years 1933 to 1937. Like most rumors started for wrong reasons, this one is FALSE! Errors usually originate from a false premise carelessly ASSUMED, unproved. The true original Church of God was founded A.D. 31 by Jesus Christ. It was a SPIRITUAL ORGANISM — not a worldly organization — yet well organized on GOD'S PATTERN. It was headed by Jesus Christ, who already had ascended to God's throne in heaven. It was founded on a SOLID FOUNDATION — a spiritual foundation — the apostles (New Testament) and prophets (Old Testament) with Christ the actual HEAD. Under the apostles and the very few prophets after A.D. 31 were evangelists, pastors, other elders and teachers, deacons and deaconesses. It was truly the "...household of God...In whom all the building fitly framed together...unto an holy temple in the Lord" (Ephesians 2:19-21), "...the whole body fitly joined together and compacted by that which every joint supplieth..." (Ephesians 4:16). But after A.D. 33 violent persecution set in (Acts 8:1). But about A.D. 53 to 59 another gospel was taking over the churches, and before A.D. 70 the Gospel Christ had preached was SUPPRESSED! The Church was forced virtually to go underground, holding meetings secretly. The apostle Polycarp (a disciple of the apostle John) and a later apostle, Polycrates, had heated controversies with the Roman bishops in the false "Babylonian Mystery" religion (Revelation 17:5), which, under Simon the Sorcerer (Acts 8), had adopted the name "Christianity." In Revelation 2 and 3 are the messages inspired by Christ from God's throne. The apostle John relates, "I was in the Spirit on the Lord's day..." (Revelation 1:10). In other words, John was taken IN VISION, by the Spirit of God, into the far future DAY OF THE LORD. From the time of Adam to now — approximately 6,000 years — we have been in the day of MAN, deceived and led by Satan. The period foretold in more than 30 prophecies called the "Day of the Lord" is the time when God supernaturally intervenes and begins taking over the world — starting very shortly, perhaps one to three years, before the second coming of Christ to RULE ALL NATIONS. The apostle John, in vision, was taken into this "Day of the Lord" called "the Lord's day" in Revelation 1:10. This period "the Day of the Lord," especially that phase of it PRIOR to Christ's coming (although it shall continue through the millennium), is the THEME of the book of Revelation. Continue in Revelation l:l0 "...and heard behind me great voice, as of a trumpet, Saying, I am Alpha and Omega (A and Z), the first and the last: and, What thou seest, write in book, and send it unto the seven churches which are in Asia..." Then Christ named the churches starting with Ephesus and ending, with Laodicea. Then, in his vision John turned and saw seven golden candlesticks and "...in the midst of the golden candlesticks one like unto the Son of man (Christ)...And he had in his right hand seven stars..."
Then follow, in chapters 2 and 3, Christ's messages to the angels of these seven churches. I studied deeply into these seven churches and Christ's messages to them 51 years ago. And I concluded on exhaustive research, that they represented the seven conditions that would be found in the Church of God at all times, from A.D. 31 until Christ's coming — BUT ALSO the seven ERAS of God's Church during these more than 1,900 years. God showed me that the Ephesus condition here described would be PREDOMINANT during the first era, the Laodicean condition described in the last era just prior to Christ's second coming, predominant just before Christ's coming. But definitely they depict SEVEN SUCCESSIVE ERAS. The predominate characteristic of the Ephesus era — the first, beginning A.D. 31, — was loss of its first love. The Church in A.D. 31 on the day of Pentecost started out with great rejoicing and deep spirituality. But by approximately A.D. 53 to 59, they already were turning to ANOTHER GOSPEL — the GOSPEL-MESSAGE OF JESUS CHRIST WAS BEING SUPPRESSED! A violent persecution had set in by A.D. 33. By A.D. 70 the true Church was virtually forced to go underground. They were discouraged — had lost their first love. But, also, that has been true of every era of the Church — only not so dominant as in the first two centuries. The Church did become scattered! Never again after the first century was it ONE WELL-ORGANIZED, COMPACTED BODY! This is a fact that most today have not realized — and perhaps most have supposed there existed a centrally organized closely knit Church from the first century until now. BUT THAT is NOT TRUE. Yet, when Christ comes, He is coming to a Church that IS well-organized — the "...household of God...in whom all the building fitly framed together groweth unto an holy temple in the Lord" (Ephesians 2:19-21). THAT IS THE TEMPLE TO WHICH CHRIST SHALL COME. THAT is the one and only Church that shall, RESURRECTED, MARRY CHRIST! But, when I first was converted and came on the scene, the Church (Sardis era) was widely scattered. There was a U.S. headquarters at Stanberry, Mo. But there were a few very small scattered groups, which we have discovered since, in Central and South America and Europe. These brethren were still keeping the Sabbath, the Holy Days (which the Sardis people in America WERE NOT), and still kept the NAME, Church of God. They are now part of the Worldwide Church of God. I was born of stable and upright parents with an ancestry in the Quaker faith that had emigrated from England to Pennsylvania with William Penn, a hundred years before the United States became a nation. At age 18 I dropped all but the most passive interest in religion. I had put myself through an intensive self-examination, coupled with a survey of the various occupations and professions to determine where I belonged — to avoid fitting the proverbial square peg in the round hole. This led into the advertising profession and a business life. I was unusually successful. I had continued through the years diligent study and application. I had planned that my business contacts were largely with the great and the near-great. Then, at age 34, I was assailed by very disturbing dual challenges. My wife, after nine years of happy marriage, had begun keeping the seventh-day Sabbath. I was aghast! That, to me, was religious fanaticism! She claimed to have found this teaching in the Bible. My first upsetting thought was, What will my business contacts and friends say? It was a devastating thought, humiliating! All the arguments came quickly to my mind. They were of no avail. She said she found this teaching in the Bible. "But the Bible says", I protested, "thou shalt observe Sunday." "Can you show that to me in the Bible?" she asked. "No", I replied, "I don't know much about the Bible. My interest and studies have been in the area of business. But I know the Bible teaches Sunday observance, because all these churches can't be wrong, and they receive their beliefs from the Bible." "If", she smiled sincerely — but to me exasperatingly — "you can show me where the Bible commands Sunday observance, I'll go back to it." There was no dodging the challenge. My marriage depended on it! Coincidentally, a sister-in-law, newly married and fresh out of college, hurled at me a second humiliating challenge. "Herbert Armstrong", she accused contemptuously, "you are just plain ignorant! Everybody who has any education knows human life has come by evolution." I was proud. I had not neglected study and education. I thought I knew the facts about evolution, and I didn't believe in it. But now I had to admit I had never pursued a thorough, in-depth research of the question. The dual challenge drove me into a determined almost night-and-day research. That intensive study continued for six months before I found the proved answer. Yet the study to this day has never ceased. I was not only humiliated and angered by these challenges, I was determined to prove both my wife and sister-in-law wrong. Both challenges focused on a common starting point, the book of Genesis in the Bible, although that was only the beginning. These challenges came at a period of life when I had ample time on my hands. I plunged with intense concentration into the study. But I did not begin the research in Genesis. First I delved thoroughly into the works of Darwin, Lyell, Haeckel, Huxley, Spencer, Vogt, Chamberlin and Moore, and even into the earlier works of Lamarck and his theory of "Use and Disuse", which preceded Darwin's "survival of the fittest" hypothesis. Immediately those writings appeared convincing. They necessarily are, to have won virtual universal acceptance in the world of higher education. I readily understood how the field of education had been gripped in the clutch of the evolutionary concept. Evolution, as I finally learned, is the atheists' attempted explanation of the presence of a creation without the preexistence of a Creator. This initial stage of my research rudely shook my faith in the existence of God. It brought me to the realization that I had assumed the reality of God, because from childhood I had heard — and therefore assumed — it. For a while my head was literally swimming. Was all I had ever believed mere myth and error after all? I was awakened to the realization I had never seen PROVED the reality of God! Now I was determined to know the TRUTH! My mind was being cleaned out from ideas and beliefs previously taken for granted. Of all the writings on evolution Moore, alone, had culled out many discrepancies in the theory. Yet he, too, went along with the doctrine overall. But now I had, first of all, to prove or disprove the existence of God. It was no casual or superficial study. I continued in this research as if my life depended upon it — as in actual fact it did, as well as my marriage. I studied books also on the other side of the coin. Suffice it to say here that I did find irrefutable PROOF of the existence of God the Creator, and I found proof positive of the fallacy of the evolutionary theory. I had the satisfaction of winning the admission of one thoroughly steeped in evolutionary thought — having spent years in graduate work at the University of Chicago and at Columbia — that I had definitely chopped down the trunk of the evolutionary tree, though like Dr. Moore, she had been so thoroughly brainwashed in it she had to continue in what she had seen and acknowledged was PROOF of its falsity. Also I had the enjoyment of being able to cause my sister-in-law to "eat those words" branding me as "ignorant." All of which was merely vanity on my part, which I had not yet eradicated. I had proved the reality of THE GREAT MAJESTIC GOD! But my wife's challenge was still tormenting my mind. Already, in the evolutionary research, I had studied Genesis. I knew each of the world's religions had their own sacred writings. Once God's reality was proved, I had expected to continue in the pursuit of comparative religions to see if any such sacred writings proved authoritative. Through which of these did GOD speak to mankind — if any? Since I had to research the Sabbath question anyway, and already I had delved into Genesis, I decided to continue my study in the Bible — intending to examine in depth the writings of other religions afterward. In my biblical study I came across early the passage in Romans 6:23: "...the wages of sin is death..." I stopped, amazed. Wages is what one is paid for what one has done. Here I was staring at a statement diametrically opposite to my Sunday school teaching prior to age 18. "Why", I exclaimed, "how can that be? I was taught in church that the wages of sin is EVERLASTING LIFE in an eternally burning hell." Another shock came on reading the last part of the same verse: "...but the gift of God is eternal life through Jesus Christ our Lord." "But", I questioned in disillusionment, "I thought I already had eternal life — I am, or I have, an immortal soul. Why should I need it as a gift?" I researched the word soul by means of a Bible concordance. Twice I found the words, "...the soul that sinneth, it shall die" (Ezekiel 18:4 and Ezekiel 18:20). Then I remembered I had read in Genesis 2 how God said to the first human, "But of the tree of the knowledge of good and evil, thou shalt not eat of it: for in the day that thou eatest thereof thou shalt surely die." In Genesis 2:7 I read how God "...formed man of the dust of the ground and breathed into his nostrils the breath of life; and man [dust — matter] became a living soul." This stated plainly that a soul is physical — formed from matter. I found that the English word soul is translated from the Hebrew nephesh and that in Genesis 1 fowl, fish and animals, all three, were nephesh as Moses was inspired to write. Next, I happened to read where Jesus said, "And no man hath ascended up to heaven, but he that came down from heaven, even the Son of man..." (John 3:13). I researched the heaven and hell teaching further. I saw where the inspired Peter, on the day he received the Holy Spirit said, For David is not ascended into the heavens..." (Acts 2:34). I was, in utter astonishment, coming to realize that what I had been taught growing up in church was the precise opposite of what the Bible says in clear language. This is not the place for a lengthy, detailed account of my intensive search in the Bible — bent on proving to my satisfaction that "all these churches can't be wrong, for their teachings came from the Bible." The essential point here is the simple fact that I did find irrefutable PROOF of the divine inspiration and SUPREME AUTHORITY of the Holy Bible as the revealed Word of God as originally written. Even all the so-called contradictions evaporated upon unbiased study. Yet, to my utter dismay and chagrin, I was forced to "eat crow" in regard to my wife's supposed "fanaticism." It was not what I wanted to believe, THEN! But by now I had taken a real beating. I had proved truth contrary to what I wanted to believe. Let me pause here to add a point to what I wrote above, saying most people believe what they have repeatedly heard or read or been taught. There are two other psychological truisms in regard to WHY people believe what they do. One is, people carelessly accept what those around them believe. Most Thais are Buddhists because those around them in Thailand are Buddhists. There is the psychological tendency to go along with one's peers. One other reason for people's beliefs is that human nature tends to cause one to believe what he wants to believe and refuse, regardless of proof, what he does not want to believe. There is the old saying, "One convinced against his will is of the same opinion still." That is why I have said the experience I was painfully subjected to in this six-months' intensive study was UNIQUE in human life and conduct. I know of no world religious leader who arrived at his teachings in such manner. Perhaps that is why GOD'S INSPIRED WORD alone– as I proved — is TRUTH. Only GOD is infallibly correct! I was brought, by the spring of 1927, to a complete MIND-SWEEPING — my mind swept clean of previous assumptions and beliefs — surrendered to the WORD OF GOD, which by then I had proved TRUE, and the SUPREME AUTHORITY. More, I had been brought to realize my own inadequacy and nothingness. I had been brought to a real repentance — CONQUERED by the GREAT MAJESTIC GOD — and with a solid rock-based FAITH in Jesus Christ. I was baptized, and the infilling of God's Spirit opened my mind to the JOY UNSPEAKABLE of knowing God and Jesus Christ — of knowing TRUTH and the warmth of God's divine LOVE! What I once hated I now LOVED. I found the greatest and most absorbing joy of my life in continuing to dig out those gold nuggets of TRUTH from God's Word. Now came a new enthusiasm in biblical study and receiving the REVEALED knowledge of God. I began to ask, "WHERE, then, is the real true Church which CHRIST founded?" My shocking, disappointing, eye-opening discovery, upon looking into the Bible for myself, had revealed in stark plainness that the teachings of traditional Christianity were, in most basic points, the very opposite of the teachings of Christ, of Paul and of the original true Church! Could the original and only true Church have disintegrated and disappeared? Could it have ceased to exist? No, for I read where Jesus said the gates of the grave would never prevail against it. Also He had said to His disciples who formed His Church, "Lo, I am with you always." Then I saw that the very PURPOSE of the Church was to preach Christ's GOSPEL! It is HIS BODY — His instrument by which He carried on GOD'S WORK! I looked carefully at that Gospel as Christ Himself preached and taught it to His first ministers. It is recorded in the four books of Matthew, Mark, Luke and John. At almost every point of teaching that Jesus enunciated, the teachings of traditional Christian bodies today are just the opposite. THEY WERE NOT PREACHING THE SAME GOSPEL AT ALL, BUT A TOTALLY OPPOSITE MESSAGE! This was shocking — incredible — unbelievable! Yet I was compelled to see it was true! Jesus began the Work of preaching the very Gospel that GOD the Father had sent to mankind through Him. He commissioned His disciples — His apostles — to carry the same Gospel to all the world. And He has said He would never drop the Work He had begun! But WHERE was it going on today? I knew now that when I found the one and only true Church, I would find a Church obedient to God — keeping His commandments — having the testimony of Jesus Christ, which is the TRUTH of the Scriptures. I had been much impressed by a description of the true Church, as it is to be found in our time just before the second coming of Christ. It is found in Revelation 12. It is the time when Satan is filled with wrath against God's Church, "because he knoweth that he hath but a short time" (Revelation 12:12). Satan is making war with "the remnant of her seed." The remnant means the very last generation in this age. The Church is definitely described. It is those "...which keep the commandments of God, and have the testimony of Jesus Christ" (Revelation 12: 17). My intensive study had revealed one thing plainly: "The commandments of God" mean "Sabbath keeping" to most traditional denominations. They say, "The commandments are done away!" They reject "the commandments of God." That automatically ruled out all churches observing Sunday. So far as I could learn, it reduced the search to three small groups — the Seventh-Day Adventists, the Seventh-Day Baptists, and a little, almost unheard-of church called the Church of God, which maintained a small publishing-house headquarters at Stanberry, Mo. So I examined Seventh-Day Adventist teachings — just as I did those of many other denominations. I obtained their magazines, their booklets and pamphlets, their large book of Bible readings or Bible "home instructor." The true Church is the one that lives by EVERY WORD of God — the words of the BIBLE! It seems necessary to add here that I have never been a member of the Seventh-Day Adventist denomination. False statements have appeared in various church or religious magazines, pamphlets or tracts that I am a former Seventh-Day Adventist. I did obtain much of their literature to compare with the Bible. I did examine and study it with an open mind, and without prejudice. I was happy to find that like most denominations, they do have certain points of truth. None is 100 percent in error. But my familiarity with Adventist doctrines has come entirely through their published literature. I have never attended a regular Sabbath church service of that denomination! Next, I looked into the teaching of the Seventh-Day Baptists. I found it to be virtually identical, except for observing a different day of the week, with other Protestant denominations — especially the Baptists. But, of these three churches to which the search had been narrowed, only one had the right NAME for the true Church. This was the small, little-heard-of Church of God whose headquarters were at Stanberry, Mo. Twelve times in the New Testament, I found the NAME of the Church that Christ established plainly stated as "THE CHURCH OF GOD." Could GOD'S Church be fruitless? The only Church I had so far found that "kept the commandments of God, and the testimony of Jesus Christ," and at the same time bore the NAME of the original true Church, was this almost unknown little Church of God with its small publishing house in Stanberry, Mo. But this left me quite confused. For this was a little church, especially compared to the Roman Catholic, the Methodist, the Baptist, the Presbyterian, the Lutheran or other large churches numbering millions of members. Then I saw where Jesus called His Church the "little flock." But still I was not completely satisfied. I was deeply concerned. I prayed a great deal over it. For here was a church, which, compared to the large-scale activities of the Catholic and big Protestant bodies, was ineffective. I could see that it was imperfect. It wielded no great power. Jesus had said, "...ALL POWER is given unto me in heaven and earth" (Matthew 28:18). I read how Jesus Christ was to be IN His Church! He guides it! He directs it! He EMPOWERS it! He said His Church was to RECEIVE POWER (Acts 1:8). No person is even a member of the true Church unless he has received and is filled and led by the Holy Spirit — and the Holy Spirit is the Spirit of POWER! This little church seemed to be powerless — comparatively impotent! I failed to see where it was bearing much if any fruit! Could a fruit-less church be the ONE AND ONLY true Church of God on earth? I was deeply perplexed. Here was a little church, with scattered members probably numbering less than 2,000, mostly in rural areas. Apparently, as nearly as I could learn, it had only a very limited number of local churches, none as large as 100 members. As I began to come in contact with some of its leaders, they seemed to be men of little education — no college degrees — its ministry could hardly he described as an educated ministry. Their preaching had a certain fire, yet seemed totally to lack the POWER that attracts sizable audiences, that moves people, stirs hearts, and changes lives. I could see no visible results. Could this be God's one and only true Church on earth? The very question seemed preposterous! Yes, and yet, small, powerless, resultless, impotent though it appeared to be, here was a church with the right name, "keeping the commandments of God and the testimony of Jesus Christ," and closer, in its doctrines and teachings, to what God had been opening my eyes to see plainly in His Word than any other church of which I knew! Small and impotent though it appeared, it had more Bible TRUTH than any church I could find! Meanwhile, what was I to do? I was not at all convinced this was the one and only true Church. Yet, if it was not, which one was? This one came closer to the Bible qualifications than any I knew. Therefore, I began to fellowship with their scattered and few members in Oregon, while at the same time refraining from acknowledging membership. We were living in Portland, Ore., at the time. I knew of no members of this church in Portland, but there was a sprinkling of them through the Willamette Valley between Salem and Eugene, in Oregon — mostly farmers or truck gardeners. They welcomed the fellowship of myself and Mrs. Armstrong. We found them to be simple, plain and humble people, hard working and industrious, and loving the Bible TRUTH — as much as they had — willing to suffer persecution for it. And so it was, in this detached fellowship, that Mrs. Armstrong and I continued the first 3 1/2 years of my ceaseless night-and-day STUDY of the Bible — of history, especially as connected with biblical history and prophecy — and of pertinent allied subjects. These, too, were years of much and earnest prayer. Much of the Bible study done at home was done on my knees, combining study with prayer. Much time was spent during these years, as it had been that first six months, at the public library. I delved into intensive research in the commentaries, Bible encyclopedias, Bible dictionaries, comparing various translations of the Bible, examining Greek and Hebrew texts of doubtful or questionable passages, checking with lexicons and Robertson's Grammar of the Greek New Testament. I made an intensive study of ancient history in connection with biblical history and prophecy. Meanwhile, on their urging, a few of these articles had been mailed in to The Bible Advocate in Stanberry, Mo. These articles began appearing on the front page. Along in November of 1930 the Runcorns, neighbors of my parents, asked me to go with them to a business meeting of brethren of the Church of God, being held in the home of Mrs. Ira Curtis, near Jefferson, Ore. Although I was a guest — I had never become a member of this church, whose headquarters were at Stanberry, Mo. — they asked me to act as secretary and take down the minutes of the meeting. I learned that the meeting was called for the purpose of organizing these Oregon members into an Oregon Conference. I sensed immediately there was a feeling of division among them. Elder A. N. Dugger was the real leader of the church at Stanberry. He was editor of the church's weekly paper sent to members. He either was, or had been, president of their General Conference. I learned that they were organized as a General Conference, with elections of officers held biannually. Most of the Oregon members lived in the Willamette Valley in the vicinity of Jefferson. Most of them were in attendance at this business meeting. About half of them were opposed to Elder Dugger. They wanted to organize a state conference. Some of the other states had state conferences. The purpose of this Oregon State Conference was to hold the tithes and church funds contributed by Oregon members in Oregon. But actually, it was born of opposition to and dissatisfaction with the Stanberry membership and state conference. The other half were just as verbal in their loyalty and support of Elder Dugger and the Stanberry regime. The dispute over Stanberry politics and Elder Dugger's personal fitness and integrity waxed more and more heated. One tall man who weighed considerably over 200, and was a leader, spoke of "dirty politics" and called Elder Dugger a "ward-healer". An equally vociferous man on the other side of the dispute rose to defend the honor of Mr. Dugger. Words flamed hotter and hotter. Each side was sincere and in roused earnest. Under the tense pressure tempers were flaring. I became afraid it was going to be settled (or unsettled) by fists. At that instant I rose, and in a loud but calm voice asked if I might say a word. Since I was a guest, they didn't refuse. "Brethren," I said, "you all know how, as recorded in the first chapter of Job, when the sons of God came together, Satan came also. You also know how, in the 12th chapter of Revelation, we are told that the people Satan is most angry with are those who keep the commandments of God and have the testimony of Jesus Christ. That means us. Satan is here. He is stirring up rage and anger in your hearts. I am going to drop to my knees right now and ask God Almighty to cast Satan out of this house! All of you who wish may kneel with me and pray silently." Without another word, I quickly dropped to my knees beside my chair and began asking God to rebuke Satan and this controversial spirit that was rousing these men to anger and to drive Satan from our presence and to give us peace and love. When I rose there were some wet eyes, but there were no angry voices. These people were sincere. They simply believed what they believed and had allowed themselves to be caught off guard and roused to anger. In early summer of that year, 1931, a former Seventh-Day Adventist minister, a Robert L. Taylor, came to Oregon from California. It was practice among these Church of God people to hold all-day meetings about once a month. It was at one of these meetings that Mr. Taylor preached. We were all quite impressed. "He's a better preacher than any of the leading ministers from Stanberry," seemed to be the common exclamation. Indeed we were all rather swept off our feet by his preaching. After a few weeks, the brethren of this Oregon Conference, which had been formed the preceding November, wanted to team Elder Taylor with me to hold an evangelistic campaign. They were becoming anxious to see a little life in the work of the Church. They found Elder Taylor very receptive to the idea. By this time a modest balance had accumulated in the new conference treasury. You will remember that the object in forming this state conference was to create a local state treasury and keep their tithes and offerings in the state instead of being sent to Stanberry, Mo. These were days of rapidly descending economic depression, but several of these brethren were vegetable gardeners. They were doing very well financially. This made it necessary that the Oregon Conference ordain me to the ministry. Being ordained and entering the ministry full time meant a complete change in my life. In former years the idea of becoming a minister was the very last thing I should have wanted to do. But by June, 1931, I had been preaching a great deal for 3 1/2 years. By this time my whole heart was in it. I shall never forget that moment of my ordination. The meeting was being held outdoors. I do not remember where — except it was in the general rural area of Jefferson. I do not remember other circumstances. But I do remember the ordination itself. It was one of those once-in-a-lifetime experiences like being married, and being baptized. Only this seemed to me to be the most momentous event of my entire life. All the brethren — as many as could get their hands through to my head — laid their hands on me — on my head, my shoulders, my chest and my back (like Acts 13:1-3). I am sure it was the weight of the experience, from a spiritual and emotional standpoint, rather than the physical weight of hands and arms — but it seemed I was entirely weighted down with the heaviest load I had ever stood up under. To me this was symbolic of the tremendous responsibility that now came down on my head and shoulders. And let it be made plain here: I was ordained by, and under the authority of the Oregon Conference of The Church of God, separately incorporated; not by the Stanberry, Mo., headquarters. The campaign was held in Eugene in a tiny tent seating 50 people. R. L. Taylor there turned out to be Pentecostal. No results came from the six-weeks, six-nights-a-week meetings, except one night when it was too stormy to hold a service. One lone couple came that night — Mr. and Mrs. Elmer Fisher. They came with me to the room I had rented, and that night Mrs. Fisher accepted the Sabbath. He already believed in it. After this, employed by the Oregon Conference, I teamed up with a young minister of the Stanberry church, Roy Daily. We held meetings at St. Helens, Ore., and Umapine, Ore., near Walla Walla, Wash. The only results came after Mr. Daily left Umapine, on finding the conference treasury was about gone, and saying, "I'm going back there to protect my own interests." I said I would serve GOD'S interests in faith — and after he left a small church was raised up. But, like others raised up by my preaching, there was no local minister and the church evaporated after a few weeks. In March, 1933, we planned a six-nights-a-week campaign in a small empty store building in the Hollywood residence section of Salem, Ore.
Now appeared on the scene two more former Seventh-Day Adventist ministers, A. J. Ray, and Sven A. Oberg. Oberg swept the brethren off their feet with his superb preaching more than had R. L. Taylor. He was a man so perfect we wondered if he was not actually an angel in disguise. He was in disguise all right! He, too, turned out to be Pentecostal. Soon the Pentecostal people with Mr. Oberg's help were taking over the meetings. Results? NONE! The shouters drove away others who had been interested. After the meetings, Mr. Oberg went to Harrisburg, where a church building was leased, to hold a campaign of his own. I had been invited to hold a six-weeks campaign in a country schoolhouse, eight miles west of Eugene, Ore. First, however, Mrs. Armstrong and I visited privately in their homes some of the people who had attended the meeting in Salem. Result? A new church of close to 50 members organized. I had asked A. J. Ray to pastor it. Under his "leadership" it lasted six weeks. Mr. Oberg was starting his new meetings in Harrisburg on Sunday night, July 9. The Fishers and I decided to start the meetings at the Firbutte school the same night. I arrived at the Fisher farm, leaving my wife and children at our home in Salem about July 5 or 6. This was the small — actually infinitesimal — start of what was destined to grow in 38 years to a major worldwide Gospel Work reaching millions of people every week. But if small, it started with a burst of energy and inspiration. First, it started with intensive and earnest private prayer. To the rear of the Fisher farm home was a fair-sized hill. Running over this hilltop for exercise I discovered a rock about 14 inches high. It was in a secluded spot. It came to mind how Jesus had dismissed the multitude and gone up into a mountain apart to pray — alone with God. I dropped to my knees before this rock, which seemed just the right height to kneel before, and began praying earnestly for the success of the meetings. It became sort of a daily pilgrimage, during my stay at Fishers', to this, which became my prayer rock. I'm sure that I drank in much energy, spiritual strength and inspiration at the prayer rock. Preparing for the meetings, I borrowed a typewriter. I think the Fishers arranged this for me through one of their relatives. With carbon paper, I typed out some 30 notices, announcing the meetings, and the topics of the sermons for the first week or 10 days. The six-weeks meetings in the one-room Firbutte schoolhouse came to a close on Sunday night, Aug. 20, 1933. A total of more than 20 had come with us — but this apparently included the 10 members of the Fisher and Ellis families, members of the Church before the meetings started. The Oct. 1, 1933, Bulletin carries the report that "with the Fisher and Ellis families, more than 20 signified their desire to establish a new sabbath-keeping Church of God in this district." In September, the living Christ began opening doors for the MASS-proclaiming of His Gospel. It was then that someone brought to my attention the fact that the local radio station at Eugene, KORE, then the very smallest minimum-power of 100 watts, had a morning devotional program scheduled, but that they were having difficulty getting local ministers to conduct the program. It was free time, carried by the station as a public service sustaining program of 15 minutes, 7:45 to 8 a.m. Immediately I went to the radio station. A woman secretary told me she felt sure they would be glad to have me take the program for a week. I was to call back later for the exact date. On my second call I was assigned the week of Oct. 9. Oct. 9 was surely a great big day in my life — the day of my very first experience before a microphone, ON THE AIR! I took this opportunity very seriously. It was an opportunity to speak to several HUNDRED people at once! I had never spoken to that many before. I spent the preceding week preparing rather extensive notes and script. I might never again have such an opportunity, so I decided to strike directly at the very heart of the Gospel of the Kingdom of God. Since the Kingdom of God is based on the promises made to Abraham, I began, on Monday morning's program with the PROMISES made to Abraham. It must have been about Thursday morning that the announcer told me the station owner, Mr. Frank Hill, wanted to see me in his office later in the morning. He had received several letters and telephone calls, from listeners requesting copies of my talks. I had offered no literature of any kind. I had invited no mail response. "This is rather surprising," said Mr. Hill. "We never had any response of any kind, before, from this morning devotional program. They told me you had not invited any. Yet it has been coming. I listened in on you this morning to see what was causing it. You have an excellent radio voice and a way of delivering your message that arouses interest and holds an audience. "Now, Mr. Armstrong," he continued, "I want to suggest that you work out a regular Sunday morning Church service, condensed into a half hour. I'd like to put that on as a regular sustaining program — free time — but I can't do that without offering equal time to every church in town. However, I will sell you the time at less than bare cost of operation, $2.50 per half hour." And THAT suggestion from Mr. Frank Hill is what put the idea of The World Tomorrow program in my mind! Altogether 14 letters and telephone calls came in to the radio station requesting copies of the messages I had broadcast. I thanked him and told him I would see what I could do. But, $2.50 every week! WOW! That was almost as much as my entire salary had been! And I had just previously renounced even that small salary! Today, $2.50 per half-hour broadcast seems incredibly small. We have to pay two or three times more than that per minute on most stations today! But it seemed like an insurmountable barrier then. Yet I knew this was GOD'S WORK, not mine. I was only an instrument. God had promised to supply every need. God had OPENED THE DOOR OF MASS EVANGELISM! He had opened the first radio door (Revelation 8:8). I knew He wanted us to walk through that door. I knew He would somehow supply that $2.50 every week. I knew also that we had to do our part, not lie down, do nothing, and expect God to do it without any effort from us. I was continuing to hold meetings at the Firbutte schoolhouse, twice weekly — Sabbath afternoons and Thursday evenings. Now came a most crucial event. It was a TURNING POINT, AN EPOCH — IN THE 1,900-YEAR HISTORY OF GOD'S CHURCH. And NOTE CAREFULLY THIS FACT. I was still cooperating with the Oregon Conference, although upon starting this new era of God's Church God had moved me to drop the infinitesimal salary I had been receiving from them. But most of their members in the Willamette Valley now began attending with us at Eugene. Oct. 21, at the home of Mr. and Mrs. Ed Smith, just across the road from the Jeans school, four miles west of Firbutte, this new Church of God was organized, with Mr. E. E. Fisher as deacon and myself as pastor. Meetings continued from that date, three times a week, Tuesday and Thursday evenings and Sabbath afternoons. Attendance was averaging 22. A first action of the new Church was the decision to go ahead with the broadcast. Three new members and the lay brethren of the Oregon Conference all approved it joyfully as an effective evangelistic activity of the Church. SURELY NOTHING could have started smaller. Born in adversity in the very depths of the Depression, this Work of God was destined to grow to worldwide power. But I did not realize its destiny then. There were no illusions of grandeur. It was not through any planning of mine that the three-point campaign then being launched was to expand into its present global scope and influence. I plunged with energy into the GIANT DOORS God was opening. Of course those doors were not GIANT at first. God always starts things He does through humans, like the grain of mustard seed, the very smallest. But I, and the newly raised-up very small Church backing me, started on the very smallest wattage of any commercial radio station — 100 watts — and once a week. Not only did I set out with a will to produce the radio program, but through 20 years of advertising experience I knew it had to be followed up. On the first Sunday in 1934 the radio program was on the air — TO STAY! And TO GROW! Response was beyond expectations. Feb. 1 The Plain Truth made perhaps the most humble bow any magazine ever made! And, to round out the three-point campaign, we continued holding evangelistic services. Since we were holding services Tuesday and Thursday nights, beside Sabbath, at the Jeans schoolhouse — the first meeting place of the present Worldwide Church of God — I hired an upstairs hall in down-town Eugene for $10 a month, for services Sunday, Monday, Wednesday and Friday nights. I had mimeographed handbills circulated to draw a public audience. I interrupt at this point to further spike a nasty rumor some have attempted to circulate against GOD'S Work, by saying that the ministers who went out of the Church in 1974 and since are "only doing what Mr. Armstrong did when he went out of the Sardis era church to start one of his own." NOTHING COULD BE FARTHER FROM THE TRUTH. In this present history of the Church, we are in 1934. 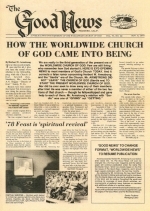 The parent Church of today's Worldwide Church was already organized — as of the preceding Oct. 21. The PRESENT WORK was well under way, small though the start was! And I WAS STILL COOPERATING WITH THE OREGON CONFERENCE BRETHREN, who attended at Eugene for some years, whenever possible. Further, to stop vicious rumors, I was NEVER A MEMBER of either the Stanberry, Mo., or the Salem, W.Va., factions of the Church of God. I worked WITH, in friendly cooperation, both factions, but never was a member of either. More important, all those who have GONE OUT or BEEN DISFELLOWSHIPPED from the Church have sought by every means to STEAL AWAY OUR MEMBERS! One minister who was doing this explained it this way: "Well, where else can we go to get members? We can't make any headway against the Seventh-Day Adventists, so it leaves us only the Worldwide Church of God." NEVER ONCE did I in any manner, directly or indirectly, make any effort to draw their members into the present Church God had raised up through me! I pray very earnestly and regularly for my son, whom I love, that God will OPEN HIS EYES TO THE TERRIBLE SIN HE IS COMMITTING, sowing the seeds of discord among Christ's brethren, trying to draw away God's people FOR HIMSELF! And, whenever he ceases this unholy activity of trying to take our members after him and will instead PROCLAIM THE GOSPEL TO THE WORLD, I will pray for his success. But when CHRIST was virtually thrown out of Ambassador College under his unauthorized policy setting and doctrinal changing, and every effort was being made to SECULARIZE the Church (which really means drive God out), I most certainly cannot uphold such satanic activity! He has been MARKED and MUST BE AVOIDED! Now on with the history of God's Church. For some years I continued to cooperate with both Stanberry and Salem factions of the Sardis era. True, some of their ministers opposed GOD'S WORK, but I never opposed them! About August, 1933, a complete split had occurred in the church headquartered at Stanberry, Mo. Its leader and editor of the weekly Bible Advocate had been voted out by a single vote. Instead of remaining loyal, he proceeded to join a C.O. Dodd, in Salem, W.Va., in setting up what they termed the "Bible organization" of the Church and made every effort to take Stanberry followers with him. At Stanberry, they had been organized under a biannual general conference system — each local church of five or more members having one vote. But now Mr. Dugger claimed a new "Bible organization" by a bizarre combination of New Testament offices, imputing to them a totally unscriptural meaning. He claimed falsely that Jesus' original 12 apostles formed a permanent board of 12 as a church hierarchy. Then he took the seven deacons of Acts 6:3, who were appointed to wait on tables serving the widows and orphans. In the King James translation, this duty was translated as "This business," the Revised Standard Version, Moffatt and others translate it simply as a DUTY. But Mr. Dugger seized on that word business and construed it totally out of context to be a BOARD OF THE SEVEN, which were to handle THE MONEY of the church. Because there had been much complaint about Mr. Dugger "running things" and assuming all authority, he adroitly appointed 12 others (by HIS CHOOSING) to be the Board of the 12 and appointed himself chairman of the Board of Seven to handle the money. This gave him absolute authority, while he pretended to give it to the "12." Then, because Jesus had sent out 70, two and two, on a special one-time tour of places where He was to come later (Luke 10:1), Mr. Dugger appointed what he called "the Board of the 70" — 70 "leading elders" — although there were not anywhere near that many elders in the church. Actually, far from being a true biblical form of organization (which God's Church does follow today), it was a ridiculous twisting out of context of biblical scriptures. But we in Oregon at that time were CONFUSED on the subject of biblical Church organization. Mr. Dugger had made it sound as if he had put together a truly "BIBLE organization." The brethren of the Oregon Conference were confused, but they did want to do whatever was the Bible way. They did not go with this Dugger organization immediately, due to this confusion. Most of them lived too far away from Eugene to attend regularly with God's Church at Eugene (we soon bought a church property in Eugene). The Work of God was already off to a good start at Eugene. I had soon appointed Claude Ellis as elder and also Mr. J. M. Day, (past 80 years of age) and Mr. W. E. Conn and Mr. Oscar Heibel as deacons, in addition to Mr. Fisher. The Dugger people had, without my knowledge, put my name down as one of "the 70 leading elders." The truth is, 1) we were all confused as to Church organization, and 2) we did not yet realize ourselves that CHRIST had started, in us, the Philadelphia era of His Church, committed with the GREAT COMMISSION. Before Elder Day had been ordained, I discussed this seriously with Elmer Fisher and Claude Ellis. We decided not to rush into it. Where was the true Church? I mentioned earlier that I was searching for the one true Church of God. These Stanberry-based brethren, as I had stated above, seemed weak and impotent. They were bearing NO FRUIT! When one of their ministers held a small "evangelistic effort" it was always fruitless. There were no conversions. This had continued to bewilder me. Jesus said we should KNOW "by their fruits." And now they were split right down the middle. A house divided cannot stand, and their two houses — Stanberry and Salem — did NOT stand! As of TODAY, 1978, each of those two has been split and re-split into so many fragments that no one could probably discern just how many branches they have split off into. Yet everywhere I went, FRUIT was borne — except when I tried to hold a campaign with one of their men, elders Taylor, Daily, Oberg and Ray. But whenever I preached alone, there were conversions. I did not realize then, as I do now, that it is GOD who "ADDS to the Church." God was adding wherever I went. Then I discovered that they are described by Christ Himself in Revelation 3:1-6. They had been, a couple of generations or more before my time, a Church of more vitality and larger membership. But they had dwindled to the state of Revelation 3:1 — still having the NAME of the true Church but SPIRITUALLY DEAD. Apparently a generation or two before my time, they had not been so spiritually dead. But now, I knew that what God had led me into was, truly, GOD'S WORK! It had vitality. It was bearing rich fruit. And, after finding the identification in Revelation 3:1-6 and verses 7-11, I finally came to realize where GOD's TRUE CHURCH WAS! These people at Stanberry and Salem, originally, had been truly the Church of God — of the Sardis era. But their era was over, and by the fruits, looking at them, I came to realize God was raising up the Philadelphia era of His Church. And, as we grew, God was showing me HIS BIBLE FORM OF CHURCH ORGANIZATION. Meanwhile, I was holding services three times weekly at Jeans schoolhouse, 12 miles west of Eugene and four nights weekly in downtown Eugene. In due time the brethren of the Oregon Conference decided to go in with the new Dugger group. That dissolved the Oregon Conference as a corporate church body. However, they continued to attend at Eugene as often as possible. After the 5 1/2 months of meetings in downtown Eugene, adding more members to the Church, we began holding services in my home (rent $5 per month) in Eugene, as well as at Jeans schoolhouse. Then, it must have been about March, 1935, I began holding six-nights-a-week meetings at Alvadore schoolhouse — about 15 miles northwest of Eugene. This was a two-story schoolhouse, with two classrooms downstairs and a hall the size of both classrooms upstairs. For six weeks I held meetings there, with, as I remember, about 15 new members added. For a while I held meetings Sabbath mornings alternately every other Sabbath at Alvadore, and every other at Jeans with a service every Sabbath afternoon at my home in Eugene. But this was too scattered, and soon we purchased the small church building in Eugene. After a conference with one of the Dugger "12" we had decided that I would cooperate with the Salem, W. Va., faction, BUT NOT JOIN. I would work in cooperation with their ministers, but ENTIRELY INDEPENDENT, and receiving NO SALARY from them. None of the Eugene church became members of the Dugger group, but we fellowshipped with them. The former Oregon Conference members in the Willamette Valley now established, under my pastorship, a regular Sabbath afternoon service. They, though not I, joined as members with Salem, W.Va. I preached Sabbath morning at Eugene church then drove 55 miles to the schoolhouse near Jefferson to preach to them Sabbath afternoons. It must have been late in 1935 that a Portland radio station opened up. Then, for a time, I preached Sabbath mornings at Eugene, afternoons at Jefferson then on to Portland for a 4 p.m. Sunday broadcast. Very shortly after that, I went on the air in Seattle, station KRSC, 8:30 Sunday mornings. In those days I continued fellowshipping and cooperating with the Salem-based faction. I had to turn the Sunday morning radio program over to my assistant elder, Claude Ellis. I preached Sabbath mornings at Eugene, Sabbath afternoons at Jefferson, then on to Seattle, arriving usually after midnight. Up at 5 a.m., a quick coffee while I scanned the Sunday newspaper at a corner drugstore for war news to broadcast, then I had to type the entire broadcast script, because World War II was by then under way, and radio announcers had to hold script on me to see that I did not deviate from it on the air. Precisely at 8 a.m. I was in my car, driving past the Boeing works, to KRSC. On the air at 8:30 — off at 9, drove on to Portland arriving about 3 p.m. for the 4 p.m. broadcast, off the air at 4:30, then the 123-mile drive to Eugene, arriving by 7:30, with a church full of people awaiting a full evening evangelistic service. Then a full week writing and printing The Plain Truth, holding a midweek Bible study, visiting members and prospective members, anointing the sick, answering mail. And STILL preaching for the Sardis church near Jefferson Sabbath afternoons! I say this to PUT AN END to the FALSE RUMOR that my son, now, or other ministers who have gone out of God's Church to draw away disciples after them, are doing what I did. Let me here cite two incidents to show that I was never a member or in the employ of the Dugger faction at Salem, W.Va. Shortly after the Oregon Conference brethren had gone in with the Dugger faction, which had pulled about half of the Stanberry members into it, I agreed to cooperate with them but not as a member — my SOLE MEMBERSHIP WAS AT EUGENE in the parent Church of the present Worldwide Church of God! We at Eugene handled our own finances for the Church. Meager though they were, starting in 1933, yet they were GROWING at approximately 30 percent per year. Soon after I decided to cooperate with them, they made a political move to stop the Radio Church of God broadcast, as it then was called, and also The Plain Truth, and to TAKE OVER the members God had ADDED to His Church at Eugene. Please read that again, and GET IT STRAIGHT as to WHO was trying to steal WHOSE members! Quite the OPPOSITE of what departed dissidents are trying to claim today! "We have decided," said Mr. Haeber, "to transfer you to Tacoma, Wash."
"Why should I move to Tacoma?" I asked. "Well, we think there is an interest there." "What do you mean, Otto, by 'an interest'? How many people are 'interested', as you say, in Tacoma?" "Well, possibly three or four," was the hesitating answer. "Otto," I said, "I have agreed to cooperate with the Salem church — but my only membership is here in the Church at Eugene and none of our Eugene members are members of the Salem church. Due to my broadcast and The Plain Truth, several hundred definitely are 'interested' here, and this is where I intend to stay." He gave up and left. A second incident occurred prior to that. Mr. Haeber came to my office, soon after I had agreed to cooperate with them. "We have assigned all the territory from Salem to Eugene to Elder A. J. Ray," he said, "and the Eugene territory to you." "I interpret that to mean that all the Eugene territory, from the city of Eugene north to Salem, is assigned to me, and that is what I shall keep." Actually, these Dugger men wanted to cooperate with me for one reason only. They saw that GOD WAS BLESSING EVERYTHING I DID WITH SUCCESS — many new members being brought in — and they wanted to TAKE OVER God's people whom God had added to HIS CHURCH, then starting a tremendous growth at Eugene, Ore.
Until I went to Hollywood 1942, to broadcast DAILY, I had continued to pastor, or to co-pastor, the Sardis people near Jefferson. As late as 1945 — 12 YEARS after Christ started the present Worldwide Church of God (then called the Radio Church of God) I was still cooperating with and helping the Sardis people. One of their "12" — John Kiesz — had moved to Canon City, Colo., because he said he needed to live there due to its dry climate. He had no means of financial support at the time. He had had a small church there, whose tithes kept him alive — but they had all moved elsewhere. I went to Canon City to help Elder Kiesz. I conducted nightly meetings for some weeks, going into Denver every week to record the broadcast, RESULT? God, through me raised up a new church there for him. God's PRESENT GREAT WORK was getting off to a start, growing 30 percent per year. By no stretch of the imagination could anyone say that I left the Sardis people to draw away their members after me. I NEVER DREW ANY OF THEIR MEMBERS — although the Henion and Cole families did of their own free choice, affiliate with that Church of God starting from Eugene. Mr. Wayne Cole, then quite small, but now in charge of Pastoral Administration in the Worldwide Church of God, will confirm this. Part of the FACTS recorded here were written in The Autobiography, yet many of them have not been previously published. I have felt it is time to STOP their mouths! As we read in Titus 1:11, there are deceivers WHOSE MOUTHS MUST BE STOPPED!" But, more important, I have felt it profitable to our brethren for me to give you this review of the BEGINNING of the Worldwide Church of God. Looking back, it is difficult for me to understand, now, WHY I was so mixed up in those days about Church organization. I knew neither Stanberry nor Salem factions had God's own form of Church organization. This had us all confused — even though, when one puts the pertinent scriptures together, it becomes crystal clear. But God's Church, though continuous through all generations from A.D. 31, LOST much or all of its original organizational pattern established BY CHRIST — until God finally restored it IN THIS END TIME through His present-day apostle. Truly, GOD HAS PREPARED A PEOPLE FOR HIS NAME — and His WIFE (God's Church of today) is making herself ready! There is only the ONE, TRUE and ORIGINAL Church of God — and today CHRIST has organized it according to the original pattern HE, THE ETERNAL, INSTALLED! My NEW BOOK, Seven Proofs of the TRUE CHURCH, is starting to appear serially in both The Good News and The Plain Truth. It leaves NO DOUBT as to the identity of the ONE and ONLY TRUE CHURCH!